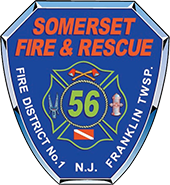 Somerset Fire & Rescue and Middlebush Fire were dispatched to a single car MVC overturned with possible entrapment. Shortly after dispatch, the incident was upgraded to confirmed entrapment of the driver. Chief 56 (Sudo) and Chief 44 (Cuddy) arrived on scene and found a single vehicle had crossed two lanes of oncoming traffic and rolled at least one time coming to rest on the passenger’s side partially off the roadway. Rescue 56 crew arrived and performed vehicle stabilization and started the extrication of the seriously injured driver. Engine 562 and Special Operations Unit 56 arrived a short time after to assist in the extrication. The driver was removed in approximately 30 minutes and quickly transported to the hospital by Robert Wood Johnson Paramedics and EMS. Engine 561 was on stand-by for the Bound Brook Fire Department during their annual carnival. While standing by, the crew just happened to catch a rainbow that formed after a brief rain shower.